FARAH'S COOKBOOK: Fruit Cake and my 100th blog Post!! Woooo Hoooooooo...........100 posts! A perfect way to end a wonderful year :) Thanks to all my google and facebook readers.....for the constant 'likes', ' beautiful comments' and encouragement! :) Looking forward for a beautiful 2013 with double the number of recipes and triple the fun! .....Wishing you all a very Happy and Prosperous New Year! .......see you all next year...........:)........HUGZZZZZZ! 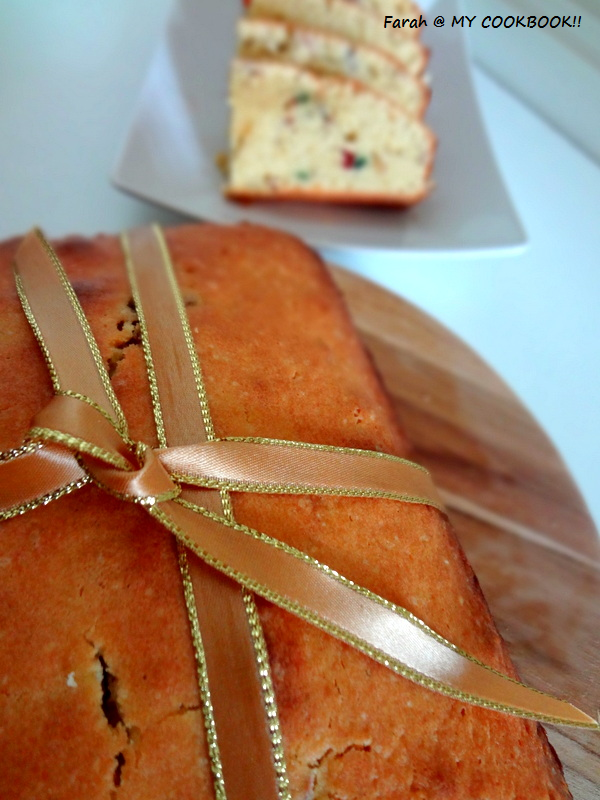 Now to todays post....Iv fallen in love with this recipe for butter cake. Its just perfect and moist. Just the way we love it. Iv made an orange cake with chocolate chips using this recipe for butter cake. Loved it. Now Iv tried it using tutti fruity and almonds, and simply loving it...again! I forgot to take a picture of the whole cake! :O .....(yeah! I guess I was in a hurry to taste it!) I used a square cake tin. ..and it was just perfect. In a large mixing bowl, cream together the butter sugar, till light and creamy. Add the vanilla essence and milk powder. 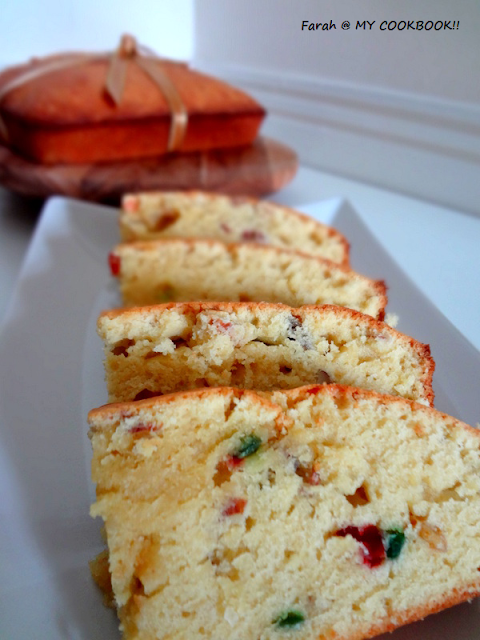 In another bowl, mix the flour, baking powder, tutti fruity and almonds. Pour the wet ingredients into the dry ingredients and mix to combine. do not over mix. Preheat the oven to 180 deg celcius . wow! looks perfect and delicious! Congrats dear :) Way to go :) Cake looks super soft and yum!!! congrats . loved your clicks and cake too. 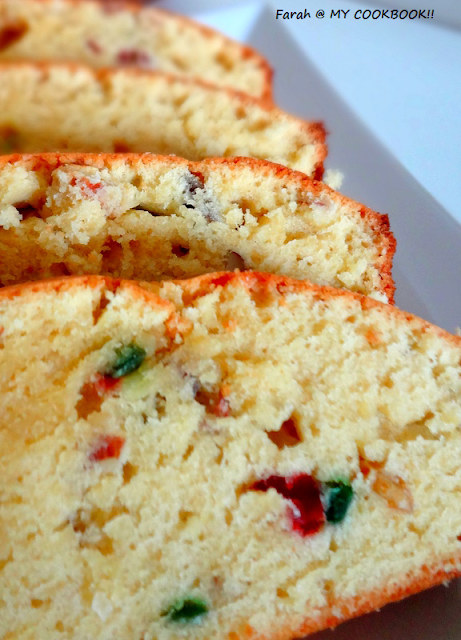 I know this post is almost six years old, but it caught my attention on Pinterest - it reminds me of a fruitcake a great-aunt made more than 50 years ago. I need to ask, though - is "tutti fruity" an actual product? Or is it just a collection of candied or dried fruits? I hope you see this question! Thank you!